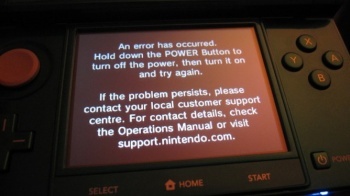 Nintendo Responds To "Black Screen of Death"
If your 3DS is suffering from the "Black Screen of Death", then Nintendo has got a fix out that should take care of the problem. It didn't take long for Nintendo to respond to the smattering of reports that some European 3DS units were randomly crashing. The company has acknowledged that there is a problem, but it's not widespread and is supposedly pretty easy to fix. "If anyone is experiencing any problems with their Nintendo 3DS console, we recommend that in the first instance they download and install the latest system update, now available online. If the problems still persist we recommend they contact their local Nintendo Customer Service centre to investigate the problem further." While it's good to hear that the issue can be (probably) taken care of by downloading the latest update, it's still a bit odd that only a small number of units were hit by the bug. Did any of you pick up a 3DS and have a problem like this? If you did, were you able to fix things by downloading Nintendo's patch?